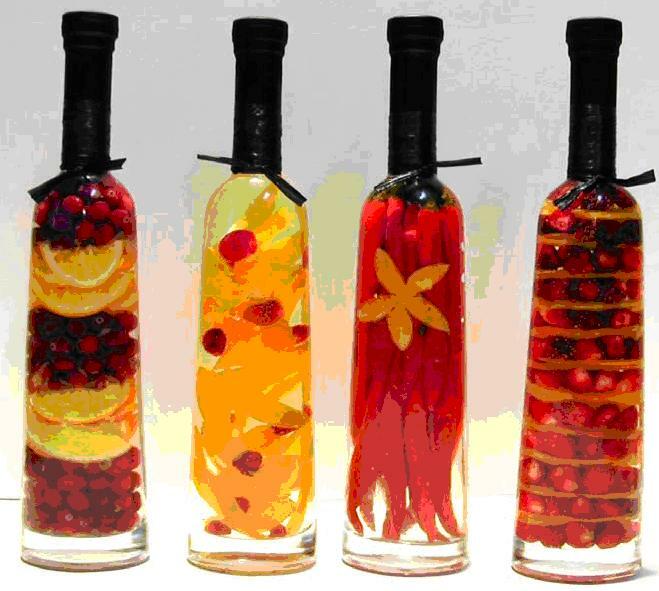 Fruit vinegars are easy to make and are the perfect homemade gift for the holidays. Homemade fruit vinegars are a welcome gift for the holidays. Two recipes are given here but you might substitute other fruits, such as raspberries, blackberries or even figs. For decoration, you can add a few cinnamon sticks or pear slices to the cinnamon-pear vinegar or uncooked pomegranate seeds to the pomegranate vinegar. For the Cinnamon-Pear Vinegar: In a nonreactive saucepan, combine the vinegar, cinnamon sticks and the pear syrup and bring to a boil over medium heat. Remove from heat and let stand for at last one or up to three hours. For the Pomegranate Vinegar: In a nonreactive saucepan, combine the vinegar and pomegranate seeds or syrup and bring to a boil over medium heat. Remove from heat and let stand for at least one or up to three hours. Using the funnel, fill the bottles with vinegar. Cork the bottles tightly. Write the name of each vinegar on a decorative label, hole-punch the label and thread it with cord or ribbon. Tie labels to the bottle necks and put the bottles in the bottle carrier. Fill the remaining compartments of the carrier with fresh fruit.